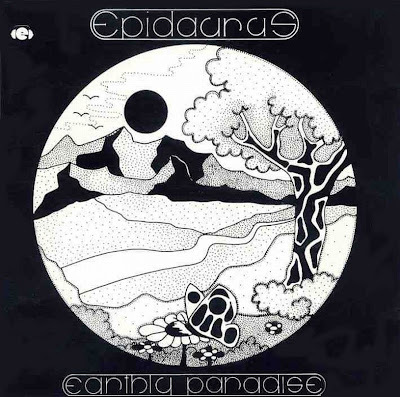 A late-1970's obscure progressive, Epidaurus had their footing firmly in the early-1970's progressive sound of bands like Pink Floyd, Eloy or Pulsar. Apparently Gьnther Henne ran his own Langendreer Studio (in Bochum), and thus with all the local talent around it was inevitable the a band would formulate out of the jam sessions that would regularly happen there. The record they released was totally self-financed, and barely distributed, hence its obscurity. In essence Epidaurus' largely instrumental multi-keyboard fronted blend was closer to Faithful Breath on their classic FADING BEAUTY, with a dreamy feel given by the haunting Mellotron and synthesizer textures, "cosmic" to want for a better term, but with one difference - the opening track has female vocals! Later, Epidaurus resurfaced under the name Choice, and more recently have reformed, attempting to cash-in on the interest generated by the CD reissue of EARTHLY PARADISE. But, be warned, ...ENDANGERED is abysmal pop styled rock, and is to be avoided at all costs! This record has become a classic. Released 1977 in an edition of 500 vinyl copies and quoted now for about US$500, it is the most wanted opus of German synphonic rock. The attentive and expensive recordings meet nowadays high demands and were processed from the original master tape to CD. The first two tracks are with vocals, the rest are instrumentals. Until today the recordings for a second Epidaurus album are unreleased, but will soon be rerecorded with the original band line up and released on CD.